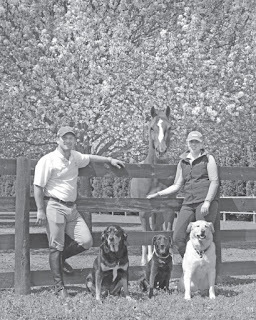 For the past decade, Melissa and Darrell Vaughn have managed the Stable on the Woods, a commercial enterprise on the edge of Aiken’s famous Hitchcock Woods. In that time, they have seen the business thrive: They have attracted boarders, taught students, bought and sold horses, and made a name for themselves as serious horsemen with superb business and managerial skills. Last June, they took the next step in their personal and professional lives, buying their own farm on Banks Mill Road. The farm already had two small barns, ideal for their personal horses and their working students’ horses. 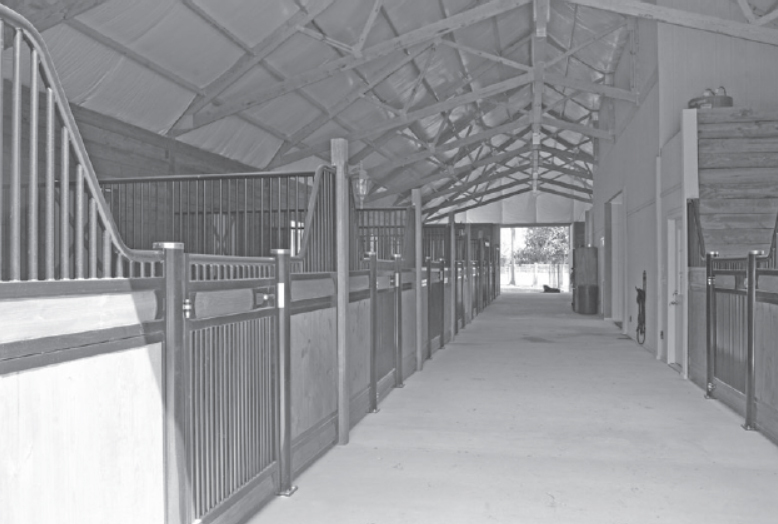 Over the summer, they added a 12-stall barn for client horses, as well as a meticulously manicured, mirrored, full-sized dressage arena with top-of-the-line GGT footing. 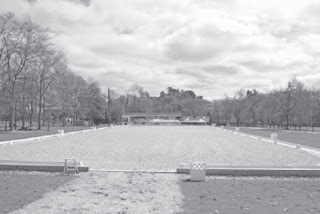 The farm occupies 12 spacious acres in an established equestrian neighborhood. 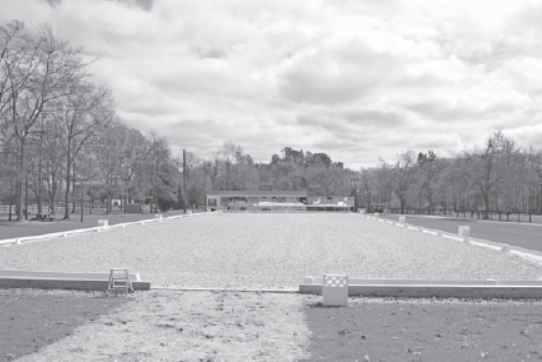 It has grassy paddocks, a round pen and schooling areas for jumping and flat work. There is also a house for the Vaughns and housing for working students. Melissa and Darrell, with their horses and dogs, moved in this past October. “We wanted to make sure that everything was in place before we moved,” says Melissa, explaining that they are not leaving their work at The Stable on the Woods. The new farm simply represents a personal investment in Aiken, as well as in their own professional advancement as horsemen. How are they able to keep up both facilities? “It’s because of Melissa’s incredible organization,” says Darrell, laughing, but not really joking. “The thing that allows us to do it is that we have great people who work for us and we have a great team at The Stable on the Woods,” says Melissa more seriously. “Jessica Miller has been my assistant manager for a number of years now, and we know we can trust her with anything. Between the organization and scheduling, it works. The new farm is called Essentia. The name, from the Latin word for “essence”, reflects the Vaughn’s sincere commitment to understanding the most important qualities of individual horses and seeking meaningful connections with them. Although they have ambitious competitive and professional goals, their main focus is on doing things right, valuing long term partnerships with their horses and their clients over any short-term success. The sales horse component is already falling into place. Darrell and Melissa have recently entered into a partnership with another professional who is importing horses from Belgium. They got the first two horses from this partnership this winter, and sold one almost immediately. The other, a 6-year-old KWPN (Dutch Warmblood) gelding named Eluca, recently made his debut in Aiken, showing in First Level dressage. A personable, friendly horse, he is an attractive prospect for any discipline. Darrell and Melissa met in Aiken about ten years ago. Melissa grew up in New Hampshire, where her parents owned a riding camp and ran a recognized event. Kazio, when she bought him, was a nervous horse with some other issues that manifested themselves in unpredictable behavior in show ring. Melissa spent years trying to figure the horse out. In 2013, she finally got the help she needed from Darren Taplin, a highly respected dressage instructor and trainer who moved to Aiken a few years ago. Sadly, Darren, who had been ill for a long time, died last October. While Melissa’s primary concentration is dressage, Darrell is more focused on all around horsemanship. This is not surprising considering his broad and varied equestrian background. Originally from Long Island, he rode for show jumper trainers such as Ralph Caristo and Buddy Brown. Moving on, he did stints in eventing with Michael Page and Charlie Plumb. Eventually, he grew tired of the life on the show circuit, and left it all to join the Marine Corps. After an injury in the service, he returned to the horse life, this time in Hawaii, where he ran his own business and got into other disciplines: reining, cutting, dressage, and even polo. One day he saw an article about Aiken in a magazine, and asked a friend what he knew about the city. Within days of arriving, Darrell was working for Jill Diaz at Estancia La Victoria in Wagener where he helped to train and exercise polo ponies. Not long afterward, he met Melissa. At the time, she had a horse that was giving her some trouble. One of the things that makes Darrell stand out is his ability to understand and help difficult horses, or horses with behavior problems. He says that many horses end up troubled because they are pushed too fast before they have a proper physical and mental base. In addition to knowing how to ride these horses, Darrell also knows how to touch them. Many years ago, he studied with Jack Meagher, the godfather of horse massage in America, and he uses massage as well as Reiki (energy work) to help horses get back on the right path. The Vaughns say they are excited about their future in Aiken, looking forward to balancing their work at The Stable on The Woods with more opportunities to fulfill their own goals at Essentia Farm. These goals start with competition, training, teaching and sales, but they seem to be more ambitious too. Darrell and Melissa are passionate about horses, and their commitment to good horsemanship is palpable. They seem to be in pursuit of something more: a deeper understanding, perhaps, of the essence of horsemanship itself.